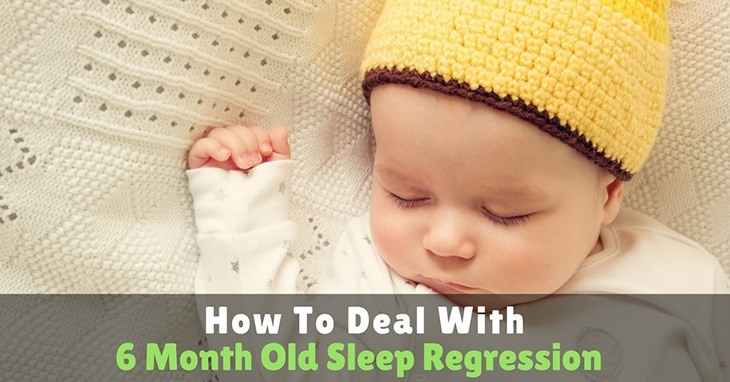 →How To Deal With 6 Month Old Sleep Regression? Sleep regressions can happen at certain stages of your baby’s life, especially when your child reaches 6 month old, and it has always become most parents’ biggest fear when it starts to happen. Also, parents often wonder how they can help their children without going back to their bad sleeping habits. Before we can further discuss about helping your children get through 6 month old sleep regression, it is best that we know what this is and its possible causes. What Happens During A Sleep Regression? How To Get Pass The Sleep Deprivation Stage? So, what is sleep regression? We often here such problem among parents but not all are able to identify what this is. A sleep regression is often described as those moments when your baby sleeps well for a long time and then, all of a sudden, without any known cause, their sleep cycle goes downhill. Sleep regressions can last from 2 to 6 weeks and frequently happens with a certain cognitive or developmental milestone. In fact, sleep regressions commonly happen at 6 weeks old, 3 to 4 months old, 6 months old, 8 to 10 months old, 12 months old, 18 months old, and 2 years old. At 6 months old, your baby most likely starts to roll more frequently. With rolling and the increase in your baby’s core strength, your baby will progress into the crawling phase. In fact, some babies can crawl as early as 5 to 6 months old. Other babies, however, tend to wait a bit later. Regardless, this significant event in your baby’s life can be a sleep stealer. You will probably see your baby in wee hours awake on his crib rocking back and forth while practicing and getting ready for his upcoming ability to move around. Also, 6 month old sleep regressions occur because your baby experiences increased hunger at this age due to growth spurt. When sleep regression occurs, there are several things that can happen. The first thing that can happen is that sleep stops. Yes, that’s right! Your baby’s nap time will become shorter. Also, your help your baby fall asleep would take forever and your baby most probably wakes up constantly and quite miserably. Fussiness will also begin to happen. Your baby will become fussy due to sleep deprivation. Also, your child will become more clingy and needy. In fact, most babies want to be held all the time. Also, feeding your child may seem like an endless task during sleep regression phases. This happens because sleep regressions are also caused by growth spurts. Your baby will constantly become hungry because he is getting bigger and needs more food. Sleep regressions can typically last anywhere from a few days to several weeks. This period can be really tough and parents often feel discouraged. Yet, you can get pass through this stage. Don’t Panic! The first thing that you have to bear in mind would be not to panic. Yes, even if you are already feeling pretty beat up. You have to remember that this is temporary and this stage will pass. Try Extra Soothing Methods. Second, you should do what works to soothe your baby. It could be that your baby prefers to be held all the time. If this is the case then this is what you should do. Also, most babies may need to be nursed or rocked to sleep. This is not a step back but taking steps to help you and your baby sleep. Get Back on Track. You have to remember that sleep regressions are temporary. It is okay to do what works to navigate through sleep regression. However, you should try getting back on the sleep path. This way, you can avoid the classic sleep regression trap, where the temporary survival tactics has become your baby’s sleep norm. Depending on what works on your baby, there are ways that can help soothe your baby to sleep. Here are some methods that you can try. Swaddle. Some babies who experience sleep regressions fall asleep faster when they are swaddled. Also, swaddling keeps them warm and secure. Co-sleeping. This may help your baby through sleep regressions. Some babies sleep better when they are near you when asleep. They often feel comfortable when they can hear or smell you. White Noise. Try white noise. Some babies sleep better when they hear various white noises like soothing music or simply the sound of a fan whirring. ​Snuggle. Snuggling with your child also helps, especially if your baby likes to be held more during a sleep regression phase. This technique also works for fussy babies. Swing. Swinging your baby to sleep may also help you and your baby through a sleep regression phase. Sleep regressions are normal and can happen in certain stages of your baby’s life. You should not fear it. Instead, you should prepare yourself for what is about to happen. Though, it may feel like an endless battle, you and your child can avoid sleep deprivation if you are able to determine how to best soothe your child during this phase. Also, it is important not to make this phase the new norm in your child’s sleep-wake cycle. Always try to get back on the right sleep track.